The rotary hoe was a Krieger (have you ever heard of them? ), 6.5 hp petrol motor, 50 cm width, self-propelled – as seen in the photo. These things sell for about $600 new (plus $100+ shipping!) on eBay. The one I was going to bid on was the same thing, used only once, and ended up going for $340. It was less than an hour’s drive away, so would have been an easy pickup too. So while I look for another used rotary hoe for sale, I’d love to hear your advice and feedback. I want to hoe up a largeish area of kikuyu grass in my yard, to turn it into vegetable gardens. It’s on a slight slope, with an area of about 200-300 square metres (but not in a square – it goes in a big ring around some raised beds and a citrus grove). My plan is to hoe the whole area, then dig paths through it on contour, shovelling the dirt onto the new beds. The paths will be filled with wood chip as a moisture reservoir and fungi haven, and the beds will be mulched with straw and planted out with herbs, vegies and other beneficial plants. My first thought was to hire a rotary hoe for the day, but rental costs $150/day. Ouch! I don’t expect to have an ongoing need for a rotary hoe once the gardens are set up, so I thought hiring would be better than buying. But if I could buy a second-hand one for a decent price, use it to set up the garden beds, and then sell it again, I’d probably be out of pocket less than the $150 and would have all the time I need to do the job properly instead of rushing it all in a single day. Have you tried anything like this before? Does a rotary hoe kill grass effectively, or will I get grass shoots coming up through the garden beds? Do you know anything about the Krieger brand? Is there anything in particular I should look for in a used rotary hoe? Any and all advice appreciated! 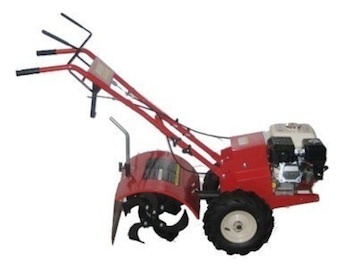 It’s hard to beat a troy bilt rototiller but the one you have pictured looks decent as well. Your best bet to make sure no grass grows back would be to kill it with roundup first. Of you wish to stay organic then till your field a few times and let it rest till after a rain then till it again. Then till it w final time before planting, this will allow for several of the seeds in the soil to germinate in between the times that you till as well as get rid of the sod clumps. @Mike: Thanks for the tips. I do want to avoid Roundup etc, but someone told me that a light spray of vinegar on grass will cause it to die back. That shouldn’t cause any chemical/pesticide issues in the soil, so I’m going to try a spot-test to see if it works. If vinegar just sets it back a bit, and I do the tilling in early winter when the grass isn’t growing, then hopefully the runners will rot in the soil before the growing season starts again in the spring. I’m not sure, and would love to hear what others think. I’ve seen Troy-Bilt recommended frequently on US sites/blogs, but I haven’t seen them much here in Australia. They are around though, and I’ll keep an eye out. Thanks! That said, I just had a commenter from South Africa on my blog say that chickens will demolish kikuyu. I have a hard time believing that they’re so fond of any grass, but I’d be very curious to see what they would do to your problem grass. @Anna: Yep, I did consider that. I’d need massive quantities of compost and mulch, though, which gets expensive fast. Plus, as I’m sure you’d agree, you can’t really buy good compost commercially. So if I went that way I’d probably truck in as much compostable material as I could, mound it up on the cardboard and compost in-place. I also don’t want to build up very high above the present soil level. We have drains, garden borders, existing trees, etc to work around. Being on a slope means that heavy rain will likely push a lot of material downhill if it’s sitting on top of cardboard. I have used our chicken tractor to create garden beds (you can see it a little here: http://green-change.com/2010/07/24/chicken-tractor-lifting-handles/), and the chickens will completely destroy every last vestige of kikuyu. But it takes several weeks for 4 chooks to clear a tractor-sized area – I’d need many dozens to clear the area I’m talking about. They also leave the ground a bit compacted, so I have to dig or fork it before mulching and planting. The main problem we’ve had with using the tractor is that you do only a small area at a time, and the grass re-invades from the edges very quickly. By clearing the whole area at once, I’m hoping that only the edges will need defending from kikuyu runners. I plan to address that by planting strips of comfrey and lemongrass along the borders to keep it out. It’s an evolving plan, though, and I’m loving the feedback and emails I’ve received so far! I thought your pigs would do a fairly decent job! @Belinda: Pigs would clear the grass, but I’m not planning on having more for a while (still eating the last ones!). It’s also an awkward area to fence off, as it would block through-traffic around the yard and it would have a very large amount of edge for its area (there’s a citrus grove in the middle that I’d need to exclude the pigs from) – it’s sort of a huge stretched donut shape. Maybe I need to post some photos or a mud-map! Not sure what your time period is, but I have laid out a tarp to kill patches of grass before. It takes a couple summer months but works. You may not have enough time for this project but perhaps can plan for the future. @Mike: Tarps or plastic sheets would work, but the area is too large and I don’t have that much plastic. Plus it’d still need some digging before I could plant into it, and that’s too big a job. I would have thought pigs would be the go. If you’re looking for sheet mulch most fruit shops have huge amounts of cardboard they’re trying to get rid of. Newsagents also have to get rid of unsold newspaper which is awesome for attracting worms once it’s wet. Depends on how much you’re trying to do at once I guess. A dingo or kanga might be worth hiring. @The Joneses: See above for comments on pigs (sorry, replying to two comments at once!). I think the area is too large, and parts of it too slopey, for newspaper or cardboard mulch to be practical. Plus I’d have to import too much compost (or compostable materials) to go on top, and I also can’t alter levels that much. I’ve seen a Dingo rotary hoe, and while it’d be faster than a regular rotary hoe, I’m sure it’d be significantly more expensive to hire (assuming I could hire one – do you need training?). @Jason: That’s probably the best way to go. Doing it twice is another argument against just hiring a rotary hoe for the day – it’s sounding more and more like I should buy one! Darren, we are also wanting to loosen soil and build garden beds on the side of our house as well as a vege patch and have been thinking of hiring a rotary hoe ($180 per day to hire !) I have just been on eBay to have a look and assess whether it is worth buying one instead of hiring. Was interested in reading you have a similar issue. Are you anywhere in Brisbane. May be we can collaborate? @Suzanne: Yeah, the hire cost blew me away too! You could buy a new one on eBay for only about 4-5 times the daily hire rate. Must be a good business to be in. Unfortunately I’m way down the coast from you, about 1.5 hours south of Sydney. Let me know if you come up with any novel solutions to the problem! I do have a rotary hoe tines on the front though and smaller than the one you have pictured. Ariens brand. Its a fabulous tool. My mum purchased it about 8 years ago and we used it to build gardens on her old property about 3 (out of 5) acres of gardens. I had the best shoulder and arm muscles of any 18 – 20 year old around from many weekends spent tilling the ground to create gardens from an old cow paddock. My husband now loves the feeling of being a “farmer” as he tills up my new garden on our suburban block. Sadly the noise scares our 2 year old and i wind up spending the whole time holding her and don’t get to share the fun. We find that virgin lawn needs to be turned over about 2 times a few weeks apart for best results. We then add compost and/or manure and give it a light go over again, not as deep but then a quick rake over, mulch and water. let it settle for a few day, usually til the next weekend then its ready to plant out. I’de offer you a loan of mine but we’re in the lower blue mountains and I imagine the fuel costs might exceed the hire costs. @Wendylady: Thanks! I agree, on that sized property a rotary hoe would be a very good way to get new gardens established. I wished you lived closer so I could borrow it! I think we’d have a bit in common besides, with home brewing, gardening, etc.